A family of birds comprising the Asian barbets, the Megalaimidae were once united with all other barbets in the Capitonidae (Short and Horne 2002) but they have turned out to be distinct. There are 26 species living in wooded areas from Tibet to Indonesia. All members of the family are placed in the genus Megalaima, except the Fire-tufted Barbet (Psilopogon pyrolophus) and the Brown Barbet (Caloramphus fuliginosus). The latter species is distinct enough to warrant placement in a distinct subfamily Calorhamphinae, whereas the typical Asian barbets make up the Megalaimatinae. The diversity is concentrated around the Malay Peninsula and Sumatra; it is therefore probable that the family originated there or thereabouts. They are usually plump-looking, with large heads, and their heavy bill is fringed with bristles. The Great Barbet (Megalaima virens), at 210 g (7.4 oz) and 33 cm (13 inches), is the largest of the species, and indeed among its relatives only surpassed in size by some of the toucans. Asian barbets are usually birds of the inner forest. 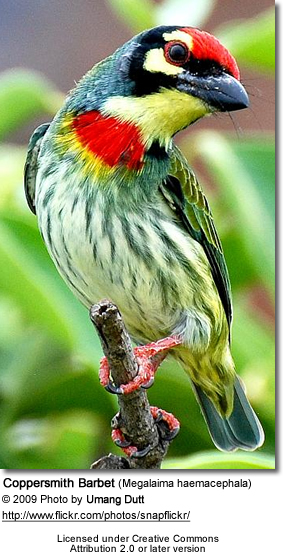 One species, the Coppersmith Barbet, is adapted to life on the forest edge and in scrub. They are mainly solitary birds, eating insects and fruit. 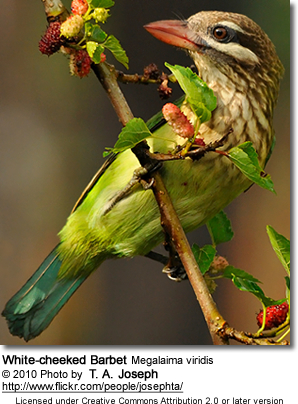 Figs of the genus Ficus are the most important fruit taken by Asian barbets. Large fig trees will attract several species of barbet along with other frugivores. In addition to figs numerous other species of fruiting tree and bush are visited, an individual barbet may feed on as many as 60 different species in its range. They will also visit plantations and take cultivated fruit and vegetables. Fruit is eaten whole and indigestible material such as seed pits regurgitated later (often before singing). Regurgitation does not usually happen in the nest (as happens with toucans). 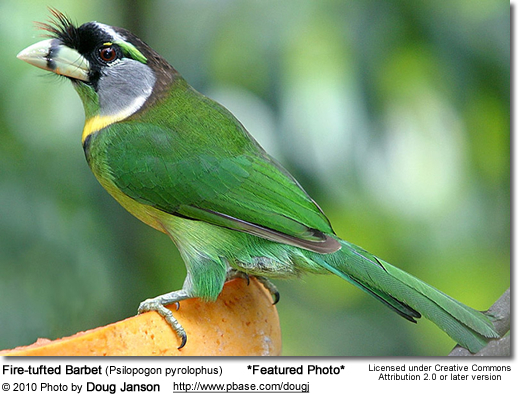 Barbets are thought to be important agents in seed dispersal in tropical forests. As well as taking fruit barbets also take arthropod prey, gleaned from the branches and trunks of trees. A wide range on insects are taken, including ants, cicadas, dragonflies, crickets, locusts, beetles, moths and mantids. Scorpions and centipedes are also taken, and a few species will take small vertebrates such as lizards, frogs and geckos. The precise nesting details of many species are not yet known. Like many members of their order, Piciformes, their nests are in holes bored into a tree, and they usually between 2 to 4 eggs, incubated for 13–15 days. Although none of the Asian barbets are considered threatened, several species are known to be intolerant of deforestation and require old-growth forest to thrive. 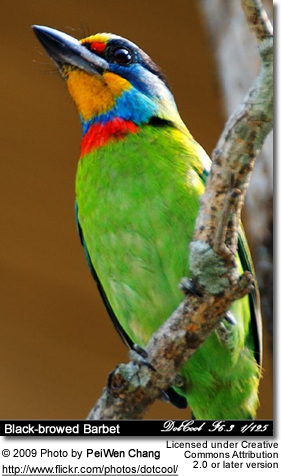 For example, in Singapore only the second-growth tolerant Red-crowned Barbet remains of the species originally found there, as well as the Coppersmith Barbet which has expanded its range and colonised Singapore in the 1960s. There is generally not much interaction between Asian barbets and humans. Some species, like the Great Barbet and the Lineated Barbet will raid plantations and orchards, particularly in India, and there is some capture for the cage-bird trade due to their pleasant coloration. It is not entirely resolved whether the Early to Middle Miocene (23-12 mya) genus Capitonides from Europe belongs to this family or the African barbets (now Lybiidae). Indeed, given that the prehistoric birds somewhat resembled a primitive toucan, without these birds' present autapomorphies, they might occupy a more basal position among the barbet-toucan clade altogether.